My mind is full of this question. As we arrive at the station we can see the rice fields, the mountains, the sea and a single stray cat. We can only hear the sound of the wind through the rice fields. We walk about 1 kilometer from the station and pass through a tunnel. After we reach the exit we can see cars heading to one shop. There it is! Many people are waiting in front of the shop. The shop is famous for Nabeyaki ramen which is popular in Susaki. The name of the shop is Mayumi no mise (Mayumi’s shop). The shop is full of people even though lunch time is over. People are also waiting in front of the shop even though the time is already 3p.m.! By the way, is this shop very important for Kochi? Maybe not. It’s a small shop in Susaki. However, for Mayumi-san which is the owner of Mayumi no mise might think it is very important like her treasure, but not only for Mayumi-san. Also for the people who lives near the shop, the people who always come to eat, and also for me! Even if it is a small shop in a rural place, it has a big meaning for us. Many people in the world love ramen, or Chinese noodles. Ramen is a Japanese food but originally it is from China. In Japan ramen is eaten as a “soul food”. We eat it anytime and I’ve never heard a person who doesn’t like ramen. But many people don’t know what nabeyaki is. In Japanese, nabe is a heavy clay pot with a lid in which stew is usually made. Yaki means to cook over a fire. Nabeyaki is a one-pot dish cooked at the table such as nabeyaki udon. This is popular in Japan. However, nabeyaki ramen is peculiar to Kochi. But why does this attract so many people? Nabeyaki ramen has been eaten since after World War Ⅱ. A man called Taniguchi Hyoma opened “Taniguchi shokudou” which is an eating house in Susaki. Because of the war, it was difficult to get food other than what was grown locally in Susaki, for example, long green onion, egg, chikuwa and so on. By chance, in front of Taniguchi shokudou there was a poultry shop so they made a soup by poultry that was shared from the shop. From this, poultry was also used for the topping instead of roast pork. (roast pork is often used in ramen) The toppings has not changed from those days. Nabeyaki ramen was not nabeyaki ramen at the beginning. It was just ramen. 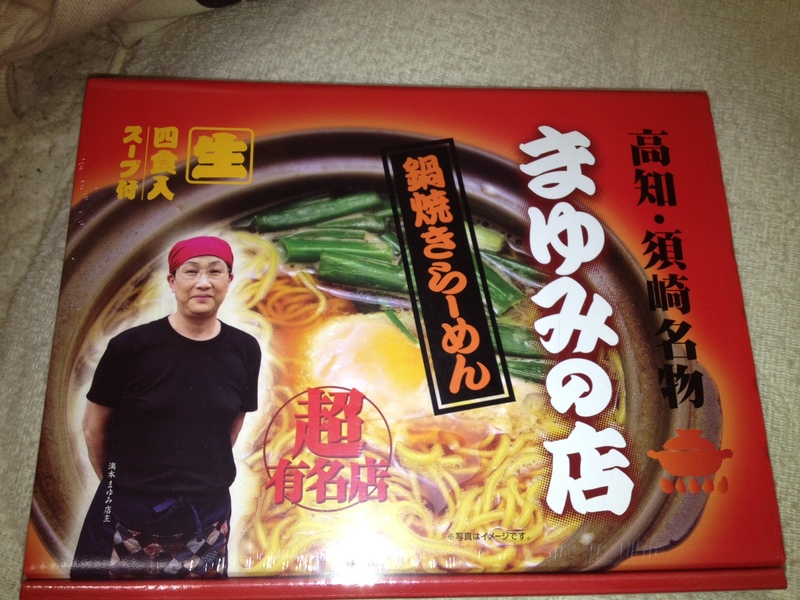 However, nabeyaki ramen came about when the owner thought to use a pot not to let the ramen cool while delivering. From this time nabeyaki ramen was added to the menu. Few years later, another shop added nabeyaki ramen to the menu and this shop used an earthen pot that is more better for not to get cool. The origin nabeyaki ramen that is eaten now is from here. After that nabeyaki ramen became popular among Susaki. At that time there was a public bath in front of Taniguchi shokudou so some people often ate nabeyaki ramen after taking bath. Also there wasn’t any shop that was open till late night so young people hung out at these shops. However, in 1975 the owner of Taniguchi shokudou died and his wife took over. Sadly though, five years later it was closed. After Taniguchi shokudou was closed customers who had loved Taniguchi shokudou’s nabeyaki ramen opened their own shops to bring back the dish they loved. One of the shops was Mayumi no mise. 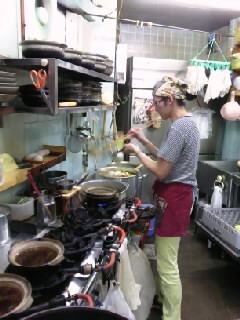 The owner of the shop Mayumi-san also ate Taniguchi shokudou’s nabeyaki ramen in her youth. Mayumi no mise didn’t have a menu of nabeyaki ramen when the shop started. They served okonomiyaki and yakisoba. The purpose to start nabeyaki ramen was that she wanted to recreate Taniguchi shokudou’s nabeyaki ramen. However things didn’t go easily. It took many years to recreate as Taniguchi shokudou’s nabeyaki ramen. Finally she reached to the goal and after that the shop became a specialty store of nabeyaki ramen. Now it is famous for the taste that is the closest to the original shop which was Taniguchi shokudou. Many people come to eat to this shop. One of the big reason why nabeyaki ramen is now known to many people is because it was introduced in a TV program. I am also one of the viewers. When I saw it I was really attracted. My family was also attracted. Maybe it was because of “ramen”. Not just me, but many other viewers must have felt the same thing. “After nabeyaki ramen was introduced on TV,” Mayumi said, “people who comes to visit this shop has really increased. They say we watched the show and came here.” As I saw the day I went, there were people not only from Kochi. I looked twice at the car that was parked because the number plate of the car was from Osaka! Now nabeyaki ramen is getting more popular than ever in Kochi. A small shop in a small town that attracts many people from many places, everybody comes to eat the “soul food.” We don’t mind taking times to go to the shop. Japanese likes to go to eat and try some ramen if they hear there is a good one. This is a new type of ramen and getting popular. A new kind of ramen attracts people. Now we can understand why people want to eat the ramen even if they have to wait a long time. Maybe you can feel if you once come! Mayumi-san says it is a just a dream to spread the shop to many places, but I hope it won’t end with just a dream. I hope this new kind of soul food will continue for many many years. Let’s wait in line and try “Japanese soul food”! I want to go to eat nabeyaki ramen—!! I’m surprised many people visit there to eat it taking a lot of time. Wahhh!!! I want to eat it, too!!! But it was quite sad that Taniguchi Shokudou had to close. Ayame, thank you for your wonderful story about nabeyaki ramen. Although I have lived in Kochi for many many years, I have yet to try it. Your story has inspired me to go to Susaki and try it this summer.